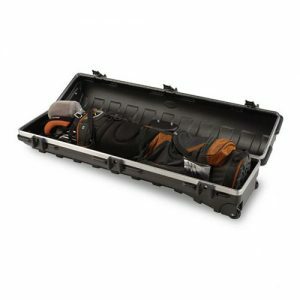 2SKB-7000 Features: -Padded removable shoulder strap.-High quality stainless steel hardware and fasteners.-Hanging jig area will easily accommodate over 40 jigs.-2 large pleated soft exterior pockets for sunscreen, gloves, pliers.-Lid opens to 90 degrees or 180 degrees to access storage through a clear acrylic door.-Made in the USA. 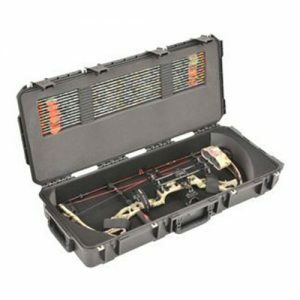 Includes: -Includes 4 each plano #3700 boxes with dividers and padded cover. Construction: -Indestructible rotational moulded construction. Colour/Finish: -Finishing case.-Colour: Black. Warranty: -Manufacturer provides unconditional lifetime warranty. 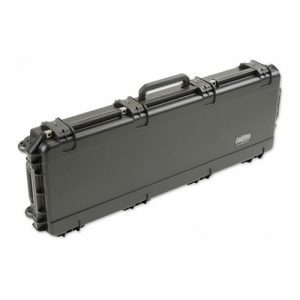 The SKB Tackle Box 7000 is made of indestructible rotationally molded construction with stainless steel hardware and fasteners. A hanging jig area accommodates over 40 jigs and includes a padded cover to keep them in place. The lid opens 90-degrees or 180-degres to access time through a clear acrylic door. Meant for the dedicated fisherman, the 2SKB-7000 is backed by SKB’s Unconditional Lifetime Warranty. 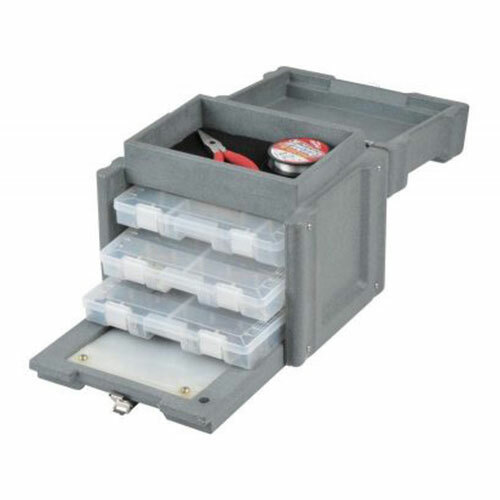 Four storage boxes with dividers keeps everything organized.